Unlike many of the options in the modern sport utility vehicle segment, the 2013 Ford Explorer Sport offers sports car like performance with the help of the high performance drivetrain from the Ford Taurus SHO – with a 365hp EcoBoost V6 and an intelligent all wheel drive system working together to offer the usefulness of an SUV and the fun of a sports car. Although the modern Ford Explorer is comfortably one of the bestselling sport utility vehicles on the market today, it suffers from the same lack of sportiness that is plaguing the majority of the segment but with 2013 Ford Explorer Sport puts a heavy emphasis on the “S” in SUV. The Explorer Sport still includes all of the attributes that help to make this large SUV one of the top sellers in the segment while the 3.5L EcoBoost V6 provides acceleration that makes this Explorer worthy of the Sport moniker. Adding to the sportiness of this package are a variety of unique exterior appointments and a sport tuned suspension while a loaded up cabin makes this sporty utility vehicle feel more like a luxury package on the inside. Of course, the fact that the 2013 Ford Explorer Sport is so packed full of drivetrain, suspension, exterior and interior technology comes with a price - $40,720 in base form to be exact. When you add in the $4,130 Equipment Group 401A, the $395 upcharge for Ruby Red Metallic paint, $750 for second row bucket seats, $570 for the trailer tow package and the $825 destination fee, the final price of my 2013 Explorer Sport test rig came to $47,390. The odds are good that if you drive on public roads anywhere in the United States, you are familiar with the look of the modern Ford Explorer. With the Explorer Sport, Ford wanted this package to stand out in a crowd but they didn’t want it to be so extreme that it would drive away buyers who didn’t want to appear to be driving some sort of track-purposed SUV. While there are some chrome bits around the exterior like the door handles, the badging and the dual exhaust tips, the majority of the body is either body colored or black. Unlike other models, the Explorer Sport wears a gloss black grille with a dark grey mesh filler, gloss black badging across the hood, black headlight bezels and dark tinted taillights connected by a gloss black trim piece that runs across the rear hatch. The Sport package also adds a set of great looking 20 inch wheels featuring a machine face and gloss black painted pockets that work with the lowered ride height of the sport suspension system to give this Explorer an aggressive, sporty stance. Aside from the features of the Sport package, the 2013 Ford Explorer features projection headlights and LED taillights that give this SUV a sporty, upscale look which is only emphasized by the blackout treatment of the Explorer Sport. My test vehicle was painted Ruby Red and while that deep metallic red comes with a $395 upcharge, I love how the Explorer Sport looks with the dark red body and black trim along the bottoms of the front, sides and rear with dark tinted windows and the package specific black trim all coming together to give this Explorer a very sinister look. The wide, low and flat posture of the modern Explorer really lends itself to looking like a true sport utility vehicle and the Sport package takes that all a step further. The black lower front fascia extends far to the ground – more like a sports car than an SUV – and the lowered stance that comes via the sport tuned suspension system allows the contrasting black side skirts and rear diffuser to have almost aftermarket lowness to them. Ford could have very easily just thrown the 3.5L EcoBoost in the 2013 Explorer, added the sport suspension and called this vehicle the Explorer Sport without any exterior changes at all but the simple black trim pieces go a long way in making this Explorer that much more fitting of the Sport nomenclature. As the pictures above and below clearly show, the Explorer Sport is a vehicle that just looks fast and when you consider how few changes have been made to the Sport package – it speaks volumes of just how sporty the modern Explorer is in its basic form. The 2013 Ford Explorer Sport is clearly a large SUV with a sport themed exterior and drivetrain package but when you step into the interior, the Explorer Sport is more like a luxury vehicle. The two tone brown/black leather theme that is displayed prominently on the heated and cooled front seats, the second row bucket seats and the compact third row seats presents a very high end look in the predominantly black cabin. From the outside, the 2013 Explorer Sport doesn’t look like a large SUV in relation to some of the vehicles in the segment but in terms of interior space, there is no mistaking the segment. The driver, front passenger and two second row passengers will find a tremendous amount of leg, knee, hip, elbow, shoulder and head room whether they are little kids or 6’4” adults. I especially like the second row bucket seats as, even though this option removes the second row middle seat, no one really uses that uncomfortable spot anyway. Considering that you have the smaller seating positions in the third row, I would definitely opt for the rear buckets and unlike some SUVs with a third seating row, the Explorer Sport can seat an adult. I wouldn’t recommend any long rides for very tall adults but for a quick run across town, the third row offers a great seating option for adults with short legs…or kids. Also, when you fold the third row into the floor the reasonably sized cargo space more than doubles in size and when you fold down the second row of seats as well – there is a large enough flat space to spread out and take a nap. There is enough space that I was able to lay stretched out in the back with the rear hatch closed so I would expect that the Explorer would work nicely for a quick camping trip for two people. The Explorer Sport is the top of the line option in the Explorer family and that comes with the excellent MyFord Touch infotainment system. This integrates a large touch screen mounted high on the dash, a touch sensitive control panel for both the sound system and the HVAC system below the touch screen, the many buttons on the steering wheel and the customizable information screens on each side of the large speedometer in the gauge cluster. I’ve experienced the MyFord Touch system in a bunch of vehicles now and while I’ve said it before, I will say it again – spending just 10 minutes parked, playing with the features of the MyFord Touch system will show just how easy it is to use the most commonly called upon features including the sound system, the navigation program and the multizone climate control. MyFord Touch is one of the best infotainment systems on the market today and if you are considering a new Ford product – including the Explorer Sport- the MyFord system shouldn’t be a negative determining factor as I would most certainly opt for this system were I to buy a new Ford or Lincoln product tomorrow. In addition to the plush leather seats and the high tech infotainment system, one unique feature of the 2013 Ford Explorer Sport is the ability to change the ambient interior color. With a simple menu in the infotainment system, you can have the interior lights change from orange to red to green to blue to purple and while some people might not be as amused by this feature as I am – this is one of those little intangible items that allows the Explorer to stand out from its competition. In the long run, the only thing that I can really say that I was missing from the 2013 Ford Explorer Sport was a big power sunroof that has almost become commonplace in the segment but those who have the same love of the glass roof panel treatment can add it for an additional $1,595 – money that I would definitely spend were I to order an Explorer Sport today. Other than that, I was very impressed by the fit and finish of the interior with plush, comfortable leather seats and the high tech MyFord Touch infotainment system while the amount of seating space in the front and second rows are more than enough for even very tall adults to sit comfortably. This is an ideal interior for a family with four children as the second row is very spacious and even though things are a little tight in the third row, there is still plenty of room for small children. The interior is ideal for a family man (or woman) but with so much cargo space and such a slick interior, this is also an SUV that a single guy can drive with confidence – whether he is taking a young lady out on a first date, taking his buddies out for a night on the town or taking a group of coworkers/clients to an important business lunch. The 2013 Ford Explorer Sport is powered by the same 3.5L EcoBoost V6 that powers both the Ford Taurus SHO and the most powerful Ford F150 pickups with this SUV based application offering 365 horsepower and 350lb-ft of torque. This power is channeled to all four wheels by means of an intelligent all wheel drive system and a 6-speed electronic automatic transmission that can be shifted manually by means of the steering wheel mounted shift paddles. This intelligent all wheel drive system is powered by Ford’s Terrain Management System that offers unique modes for Normal Driving, one for Mud and Ruts, one for Sand and one for grass, loose gravel and snow. This system alters the traction and stability control systems while also adjusting the power distribution of the AWD system to make the best use of power but in my time driving the 2013 Explorer Sport, I was only able to really get a good feel for the Normal setting due to the warmer, dry weather in my area…and my lack of desire to take such a great looking SUV into rough offroad conditions. While I didn’t get a chance to experience the 2013 Ford Explorer Sport in action in the mud, sand or snow, I did put this sporty utility vehicle through the paces in every possible “normal” autumn driving condition from high performance driving to chugging through rush hour traffic to towing a horse trailer and in every situation – the Explorer Sport sparkled. The combination of the sport tuned suspension system, the intelligent AWD system, the smooth shifting 6-speed transmission and the 365 horsepower EcoBoost V6 makes this roomy ute one of the most exciting SUVs I’ve driven whether I was blasting down the highway or tearing through the curves of a country road. Not surprisingly, the EcoBoost V6 affords the Explorer Sport a ton of acceleration whether you are launching from a stop or putting the hammer down to pass slower moving traffic on the highway. From a stop, there is little enough turbo lag that most drivers won’t be able to distinguish between turbo lag and the normal time needed for an engine to get up to its peak power output and from a more experienced perspective, what little turbo lag is present is slight enough that its hardly worth mentioning. However, since some skeptics of the EcoBoost (and other turbocharged engines) cite turbo lag as one reason why a naturally aspirated is better, it is worth mentioning that Ford has designed the EcoBoost engines to offer as little of that delay as possible. When you are cruising on the highway and you hammer the throttle, the transmission shifts smoothly and confidently, allowing the EcoBoost to quickly reach its peak numbers as it thrusts the Explorer Sport well past speeds that are comfortable to most people in a big hurry. The next aspect of the 2013 Ford Explorer Sport that makes it so much fun to drive is the sport tuned suspension system that allows this large SUV to take tricky corners at higher speeds with plenty of confidence. Whether you are speeding through a tight 2 lane road that keeps you constantly cutting back and forth around tight turns or soaring down the highway, taking longer sweeping turns as much higher speeds, the Explorer Sport is one of the more nimble SUVs Ive driven and when you consider the fact that it costs under $50k – it is very possibly the best handling true SPORT utility vehicle on the market. Best of all, the sport tuned suspension has very little negative impact on the ride quality so when performance isnt a concern, this suspension package still offers a smooth, comfortable ride…even when hitting rough unpaved roads. This sport suspension is stiffer than the standard Explorer suspension and that causes a touch more of the “road noise” to be transferred into the cabin but for a vehicle that handles so well, the Sport package does an incredible job of maintaining ride quality on even very rough surfaces. I understand that not every SUV buyer is looking to do much racing so for those drivers who want a vehicle that CAN lay down some serious power or hammer the curves on occasion while also being very civilized during normal driving situations, the 2013 Ford Explorer Sport is ideal. While driving gently around town, the EcoBoost is quiet (actually quieter than I like but I prefer loud performance models) and the transmission shifts are very smooth so as performance models go, this is not an SUV that is going to prove to be too rough to provide a comfortable ride for the family on the way to grandma’s house. Add to those attributes the fact that this large SUV will still offer better than 20 miles per gallon on the highway and the ability to confidently tow up to 5,000 pounds and you have an SUV that can be your work horse or family hauler while still offering a drive quality that will have you looking forward to your next trip. 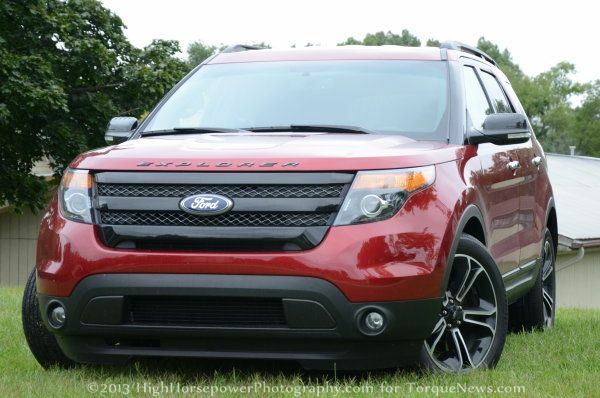 I really enjoyed driving the 2013 Explorer Sport and I bet that you will too. While the fully loaded price of $47,390 makes the Explorer Sport one of the most expensive Ford models outside of the F Series lineup, that price leaves very little to ask for from a large SUV. The 2013 Explorer Sport has a sharp, sporty exterior design that feature subtle cues that allow this model to stand out from the other modern Explorers, a gorgeous interior layout that is plush and loaded to the gills with modern technology, the ability to offer 22 miles per gallon on the highway and driving characteristics that have become nearly impossible to find – all of which come together to make the Explorer Sport one of the most entertaining SUVs sold in America and possibly the most exciting large SUV under $50k. If you are a buyer who wants an SUV that is fun to drive, can haul 6 people, can tow up to 5,000 pounds and still offer better than 20 miles per gallon on the highway – the Explorer Sport is definitely one of the best options on the market.